Good Friday reminds me of a presentation John and I heard 28 years ago at the PLGC Mid-Winter Conference. Sandy Brawders, a graduate of Princeton Seminary, stated that it was her conviction that Jesus did not intend to die on a cross, that he had hoped for a better response from those to whom he brought his message. She also felt that he would be aghast to discover that we have adorned our churches, both inside and out, with crosses. And sometimes even crosses bearing his broken body, displaying him at the time of his utmost pain and suffering, glorifying his death rather than his life among us. It was an interesting perspective, I guess, but if there had been no crucifixion, we wouldn’t have all those blood hymns, “Are You Washed in the Blood,” “There is a Fountain Filled with Blood,” “Alas, and Did My Savior Bleed,” “There Is Power in the Blood,” “Precious, Precious Blood of Jesus,” “What Can Wash My Sin Away, Nothing But the Blood of Jesus” etc., etc., etc. Also, we wouldn’t have all those wonderful hymns about the cross, “The Old Rugged Cross,” “Beneath the Cross of Jesus,” “At the Cross,” “In the Cross of Christ I Glory,” “When I Survey the Wondrous Cross,” “Must Jesus Bear the Cross Alone,” etc. And without a martyr, there would have been no lasting Christian movement. The introit and anthem will be the same ones we sang for the Easter service last year. https://youtu.be/ngDhl7MGvMw “He Is Exalted” played by Tolu A.
Twila Inez Paris Wright was born 28 Dec 1958 in Fort Worth, Texas. She is the daughter of Oren II and Rachel Inez Paris. Oren Paris II is the founder and Chancellor of Ecclesia College in Springdale, Arkansas. Twila Paris married Jack Wright. They live in Fayetteville, Arkansas. They have a son, J. P., whom she home-schools. She has an entry in the Encyclopedia of Arkansas History and Culture. The opening hymn is no. 123, “Jesus Christ Is Risen Today.” The fourth stanza (a doxology) was authored by Charles Wesley. 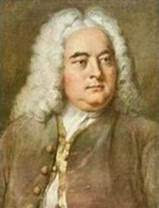 The first three stanzas and the tune were included in the first publication of the hymn in English in 1708 in Lyrica Davidica, or a Collection of Divine Songs and Hymns, Partly Newly Composed, Partly Translated from the High German and Latin Hymns, and Set to Easy and Pleasant Tunes. “Jesus Christ Is Risen Today” is an anonymous translation of an anonymous Latin hymn, “Surrexit Christus hodie,” probably from the 14th century. In 1749, the second and third stanzas were rewritten without reference to the original Latin, but the tune (also anonymous) is mostly unchanged. The choir anthem is “Alleluia, He is Risen,” (with trumpet) arranged by Cindy Berry. You can hear an audio recording of a performance of a version with the orchestration by Brant Adams by going to this link and clicking on the “Play” icon. Cindy Berry is the church pianist and her husband Bruce is the Minister of Music at the First Baptist Church in Killeen, Texas. Dr. Brant Adams is professor of theory and composition at the Department of Music of Oklahoma State University. He was born in 1955 and raised in Gallipolis, Ohio. He has a bachelor’s in music from Capital University, Columbus, Ohio, a master’s of music in music theory from the University of Cincinnati College-Conservatory of Music, and a doctorate from The University of Texas, Austin. He first taught at Mercer University, Macon, Georgia, and taught at The Ohio State University after 1987. The gospel lesson is Matthew 28:1-10. This is the last chapter of the gospel, and it tells of “Mary Magdalene and the other Mary” finding an empty tomb. It is a much grander story than the one found in Mark, the earliest gospel, which ends abruptly with the tomb being found empty (though both a short and a long resurrection story was tacked onto the end of Mark later). In Mark, there are three women (Mary Magdalene, Mary the mother of James, and Salome), and they find the tomb with the stone already rolled away. In Matthew, when the two women reach the tomb, the stone has not yet been rolled away. Then there is an earthquake; an angel (with an appearance like lightning and clothes as white as snow) descends from heaven, rolls away the stone, then sits on it. “Do not be afraid; I know that you are looking for Jesus, who was crucified. He is not here, for he has been raised, just as he said. Come and see the place where he was lying. “Do not be alarmed. You are looking for Jesus the Nazarene, who was crucified. He has been raised! He is not here. Look, there is the place where they laid him. In John, two disciples run to the tomb. 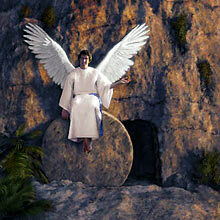 (It seems men become more and more important in the tomb story as time goes on and other gospels get written.) 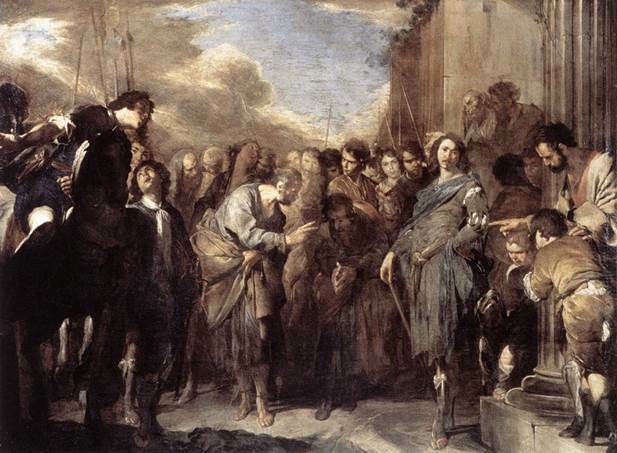 John also has the story of multiple appearances of the resurrected Jesus, including his appearance to Doubting Thomas, which occurs only in the gospel of John. Acts 10:34-43 follow the story of Simon Peter falling into a trance and seeing a vision which causes Peter to realize (with the help of the Holy Spirit) that he should accept the invitation of Cornelius, the centurion of Caesarea, to come and preach to him, even though Cornelius is not a Jew. The second hymn is “The Strife Is O’er, the Battle Done” no. 119. It is an anonymous Latin hymn dating from 1695. It was translated by Francis Pott in 1861. The tune is VICTORY and was composed by Giovanni Pierluigi da Palestrina in 1591. The adaptation of the tune by William Henry Monk includes three “alleluias” that are sung only before the first verse and after the last verse. Palestrina was born about 1525 in Palestrina, near Rome. He was listed as a chorister in Rome in 1537. He was influenced by the northern European style of composing by two composers from Holland, Buillaume Dufay and Josquin des Prez. From 1544 to 1551, Palestrina was the organist of the cathedral of St. Agapito in Palestrina. Pope Julius III, who had been Bishop of Palestrina, appointed Palestrina musical director of the Julian Chapel Choir of St. Peter’s Basilica. The tune VICTORY is a melody from a Palestrina Magnificat, the Gloria melody. 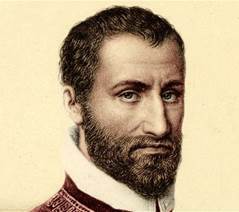 Palestrina died of pleurisy in Rome on 02 Feb 1594. Francis Pott, the translator, was born 29 Dec 1832, and attend Brasenose College, Oxford, obtaining a B.A. in 1854 and a M. A. in 1857. He became an Anglican priest in 1857. Ken and Sandy will sing “The Holy City,” with trumpet accompaniment by Joe Porcelli (and also keyboard on CD) for the offertory. The composer, “Stephen Adams,” was actually Michael Maybrick, though, as a composer, he was better known by his pseudonym. He was born 31 Jan 1841 in Kenya. His father, William, was born in Liverpool and was an engraver. His uncle, also named Michael Maybrick, was an organist and the conductor of the Liverpool Choral Society. Maybrick studied keyboard and harmony in Leipzig in 1865, but then switched to training as a baritone in Milan, Italy. He appeared in London in Mendelssohn’s Elijah in 1869 and received glowing reviews. He also appeared in Wagner’s Lohengrin. Around 1870, Maybrick began writing his own music for himself to sing. He published it under the name Stephen Adams. His compositions were very popular and included “sea songs” such as “Nancy Lee,” “They All Love Jack,” and “The Midshipmite.” He wrote sentimental, romantic, and sacred songs. “Nancy Lee” sold over 100,000 copies. He toured the United States in 1884. When he performed his music, “The Midshipmite” was one of his most requested pieces. Some found him charming, others thought him arrogant and vain, according to the Oxford Dictionary of National Biography. At age 52, he married for the first time. 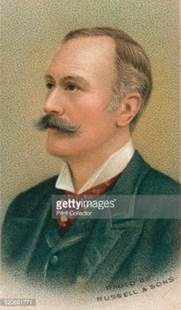 He married his housekeeper, Laura Withers, age 40, and they raised the two children of his brother, James Maybrick, a Liverpool cotton merchant. His brother James was suspected of being Jack the Ripper. When James was murdered, his wife, Florence, was charged with the crime. She was convicted of his murder in 1889, but she was released fifteen years later upon re-examination of her case. Michael Maybrick died on 26 Aug 1913 on the Isle of Wright. In 2015, the British novelist, screenwriter, and director, Bruce Robinson, wrote a book called They All Love Jack: Busting the Ripper. In what The Guardian describes as a “deeply researched Ripper theory,” Robinson identifies a new prime suspect, Michael Maybrick! Robinson rejects the idea that James Maybrick was Jack the Ripper. He focuses on the composer of the music of “The Holy City” as the true serial killer. He uses true TV mystery logic—that the least suspicious person is the one who actually committed the crime—to reach his conclusion. Here is a performance of “The Holy City” in Columbia, South Carolina, at Saint Peter’s Catholic Church. It is remarkable because of how difficult it must have been for the organist. The piece is sung by two guys, Mark Husey and Antonio Rivera. Mark Husey not only sings the tenor part, he also plays the organ at the same time (including the pedals), and keeps changing the registration throughout. This is an interesting performance, though not without a few flaws. I like it because I can make out the words—at least until the choir overpowers him near the end. The author of the words of “The Holy City,” Frederick Edward Weatherly, was born 04 Oct 1848 in Portishead, Somerset, England. He not only wrote the words of “The Holy City (1892),” he also wrote “Danny Boy (1913)” and “Roses of Picardy (1916).” In addition to writing the lyrics to over 3,000 songs, he was a lawyer and author. He was the eldest son of a medical doctor. He attended the Hereford Cathedral School, then went to Oxford University on scholarship (Brasenose College) where he obtained a degree in Classics in 1871. He married Anna Maria “Minnie” Hardwick of Axbridge in 1872 in Somerset, with whom he had three children. They separated in 1900. 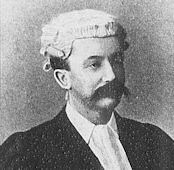 Weatherly became a barrister in 1887 and practiced in London and in the west of England. About 1902, a Maude Eugenie Beatrice Francfort of Esher in Surrey began living in the same household with Weatherly. She used the surname “Weatherly” while they lived together in Bath, though Frederick never divorced his wife. His wife, whom Frederick supported financially until her death in 1920, lived in Portishead. In his last years, he was a popular lecturer and after-dinner speaker. His partner, Maude Francfort, died in 1923, and he then married the widow of the tenor John Bryan, Miriam Bryan née Davies. Miriam Bryan had been Maude’s nurse and companion during the last years of her life. In 1926, he was made King’s Counsel (a senior barrister). He died on 07 Sep 1929 at age 80. You can peruse some of the books he authored here: https://www.google.com/search?tbo=p&tbm=bks&q=inauthor:%22Frederic+Edward+Weatherly%22 , including Oxford Days: Or, How Ross Got His Degree (1879). Hymn no. 122, “Thine Is the Glory” is the closing hymn. It is sung to a tune from Georg Frederick Handel’s Judas Maccabaeus. Edmond Louis Budry was born 30 Aug 1854 in Vevey, Switzerland, and died in Vevey on 12 Nov 1932. He studied theology in Lausanne and was a pastor from 1881. He was pastor of the Free Church of Vevey from 1889 until his retirement in 1923. He wrote this hymn in 1884. The prelude is “Christ Is Alive,” a selection from Mary McDonald’s arrangements in her three-part Easter Suite for Organ, Sacrifice and Splendor (2012). 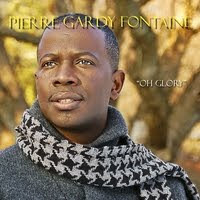 “Christ Is Alive” is a fanfare-like prelude that incorporates a bit of the well-known tune TRURO. TRURO is not only the tune used with the Brian Wren hymn “Christ Is Alive! Let Christians Sing,” (1968, alt. 1978). It is also the tune used as a setting for “Lift Up Your Heads, Ye Mighty Gates.” TRURO is an anonymous tune and was first published in Thomas Williams’s Psalmodia Evangelica (Vol. II, 1789). The tune is named for a city in Cornwall, England. Always good advice, I would say. Mary McDonald was born in 1956. She graduated from Carson-Newman College in East Tennessee in 1978. She then served as organist at Beaver Dam Baptist Church in Knoxville. At the time, she did not read music well, so she played by ear and improvised the service music. 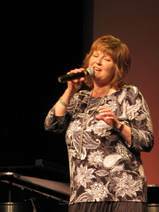 In 1985, she served as accompanist for the Tennessee Men’s Chorale. In 2000, she became president of the Southern Baptist Church Music Conference—the first woman to hold that position. She is currently organist at Central Baptist Church, Knoxville, Tennessee. She has published over 800 choral anthems, cantatas and keyboard works. She married her high school sweetheart, Brian McDonald. (She had first dated Brian’s brother. As Mary McDonald remarks, “What can I say, it’s Tennessee.” ) Brian is an architect. They live in Knoxville. The offertory music is "The Holy City." See vocal music, above. Sigmund Hering was born 10 May 1898 in Austro-Hungary. He studied at the Academy for Music and the Performing Arts in Vienna from 1915-1921. On 27 Mar 1921, he immigrated to the United States with his parents and his brother and sister-in-law. (On the ship’s manifest, the S. S. Lapland, his father’s occupation is also shown as “musician,” and his language is shown as Yiddish. Sigmund’s nationality is shown as “Polish.”) After immigrating to the United States, he also obtained a degree from the Curtis Institute of Music in Philadelphia in 1930, where he majored in trumpet an double bass. He was also a skilled pianist. He was a trumpeter with the Philadelphia Orchestra from 1925 to 1964. Sigmund Hering was the most influential trumpet teacher of his generation. He published 32 etude and method books (with 408 trumpet etudes) which his students used. He taught his students sight-reading, transposition, and the orchestral repertoire. He gave lessons at the Settlement Music School in Philadelphia for over fifty years, but (at least in his later years) he never played at lessons. He died in January 1986. I didn’t find a YouTube video of Hering’s “Classic Pieces” but I did find videos of Hering’s “Progressive Etudes.” Here is #29.